The Darwin Symphony Orchestra’s has announced its new Artistic Director and Chief Conductor, who will lead the orchestra in a world first. Matthew Wood, will lead the orchestra in a concert at Uluru in Central Australia later this year. 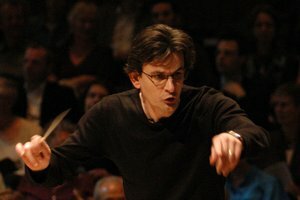 Originally from Broken Hill in NSW, Mr Wood comes to Darwin after eight successful years in the United Kingdom conducting some of the finest orchestras in the UK and Europe. Selected from a field of 50 international candidates, Mr Wood said he was committed to bringing to NT audiences the wonders and excitement of hearing a live symphony orchestra. “The DSO is an orchestra that wants to play and is passionate and full of enthusiasm for what they do and what they bring to the community,” he said. “The season ahead if full of highlights including two opera galas celebrating the 200th birthday of Giuseppe Verdi with two of Australia's most respected singers, Emma Matthews and James Egglestone and a tour to Alice Springs and Uluru in October.